Elise is a Certified Professional Dog Trainer – Knowledge Assessed, a Certified Pet Stylist, Pet CPR trained and our Canine Operations Officer. While she always loved animals, it wasn’t until 2009 that her inspiration for dog training came in the form of a six year old white german shepherd, Kiba, she adopted from Miami Dade Animal Services. Kiba had many behavioral issues including aggression, which prompted Elise to learn everything she could about behavior modification in dogs. After successfully rehabilitating Kiba, Elise started her professional dog training career in 2010 by earning accreditation through a big box pet store. 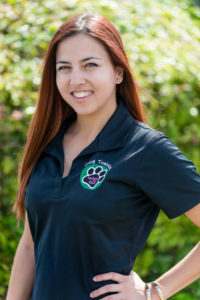 In order to further her knowledge of dogs, she became a certified dog groomer in 2013 and was able to apply her skills in behavior to grooming dogs of all ages, breeds, shapes and sizes. Then in 2014 she volunteered at a veterinarian hospital to broaden her skills. Elise was recruited to join the AYP family in January 2015. In her spare time, Elise loves spending time with her two wolf dogs, Siren and Pyro, and her rescued bully mix, Snapples. Elise also enjoys volunteering to photograph rescue dogs as she helps them work through the behavior issues currently preventing them from being adopted.